On Saturday, August 9, members of Council #14360 hitched up their workboots and went to work. 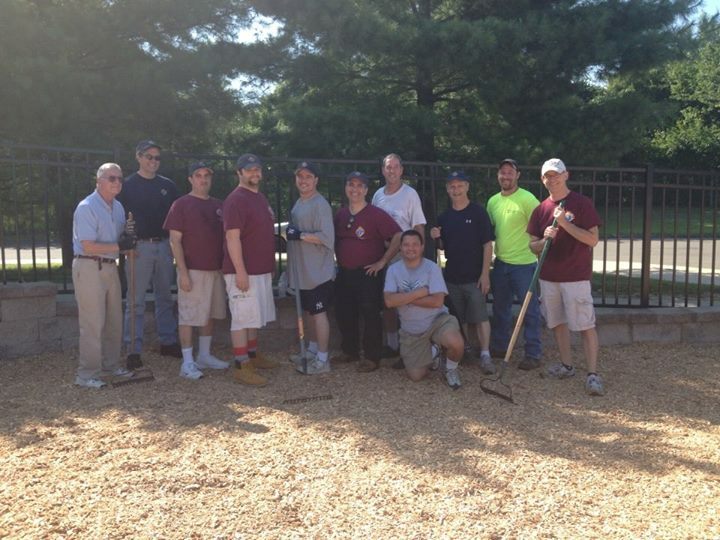 The brothers helped nearby All Saints Catholic School re-mulch their science park/playground for the students who will be returning soon. It was a large job made much easier by a big turnout of volunteer Knights. Great thanks goes to Brother Knight A.J. Cossuto, who brought workers and his pay loader to help move tons of mulch for spreading. Grand Knight George Ribellino praised his brothers for their efforts. “Saturdays are days off for many, but when it comes to helping in the community, this council never takes a day off. I thank my fellow brothers who came out on an early warm Saturday morning to help Norwalk’s lone Catholic school with this endeavor”, said Ribellino. This is not the first time this summer that Council #14360 was at All Saints. Back in June, the Fourth Degree Knights came out to help celebrate the graduation of the school’s 8th grade class.